Story's a fossil. But effects are high in the "wow" factor. My Take: Terrific special effects make this film worth a million bucks. 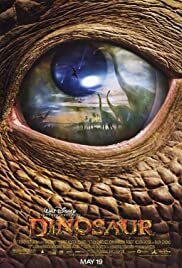 Through their discovery of the magic of CGI, Disney has brought their own expensive big-budget CG spectacle called DINOSAUR in 2000. Although CGI has already brought to life dinosaurs before in JURASSIC PARK and its sequel THE LOST WORLD: JURASSIC PARK, sometimes DINOSAUR has certainly improved from which it started from. The special effects in DINOSAUR are truly spectacular. What's fantasy and what's reality is now indistinguishable. In terms of plot and story, however, DINOSAUR is still not well developed. The story is nothing new and for Disney, that's quite a disappointment. Disney, a master in both animation and storytelling, is now lacking in a new story to show. Still, nonetheless, DINOSAUR is still a wonderfully good-looking fantasy that appeals to kids and adults. The story is nothing original, as Disney simply owes from other animated movies, some of which is their own. The plot that dinosaurs, after a meteorite strike, creates a large famine leading to a search for a valley of fertility is recycled from both a segment in Disney's FANTASIA called "The Rite of Spring", as well as Don Bluth's animated THE LAND BEFORE TIME. The lead character, an Iguanadon named Aladar, is separated from his mother, who is supposedly dead, is like the character of BAMBI in Disney's own animated film of the same title. The rest of the characters aren't new with any zing. Still, the film is an enjoyable showcase of fine special effects and excitement. It's still good as visual entertainment. A lot more fun to look at rather than to think about. I liked just looking at the very colorful effects, showing us numerous sights of dinosaurs of all shapes and sizes. The opening scenes were the most colorful, where we are taken to flight in the wings of a flying Pteranodon, switching from various scenery that is a breathtaking sight. There's a lot of imagination that went to the effects, and the heart is not forgotten. Rating: **** out of 5.